Mon, Feb 11, 2019, 09:11 pm SL Time, ColomboPage News Desk, Sri Lanka. Feb 11, Colombo: The new Chairman of the Sri Lanka Tourism Development Authority (SLTDA) and the Sri Lanka Tourism Promotion Bureau (SLTPB), Kishu Gomes said tourism has the potential to be top foreign exchange earner and invited all stakeholders to work together to achieve the targets. The newly appointed Chairman assumed duties today at the Chairman's office of SLTDA amid religious blessings. "What is important for us is to enhance it by product development, extensions and market it more strategically focusing on the right markets to be the preferred choice of the global traveler," he said. 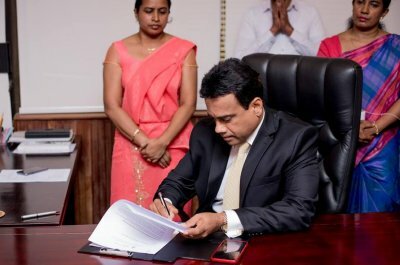 He also invited all the stakeholders of the industry to join hands with the two organizations - SLTDA and SLTPB to work towards the common goal and strategies to deliver the expected results and to help the country's economic and social development to ensure a better quality of life together for the 22.5 million Sri Lankans.